Useless. Utterly useless. When it comes to style in summer that's really the only way you can describe a former goth kid like myself. Instead of integrating with everyone else into floral patterns, brights and tanning at the first sight of sun I'm still sat clutching my winter wares, destined for a life in dark knits, greys, varied shades of black and a summer of melting in general! 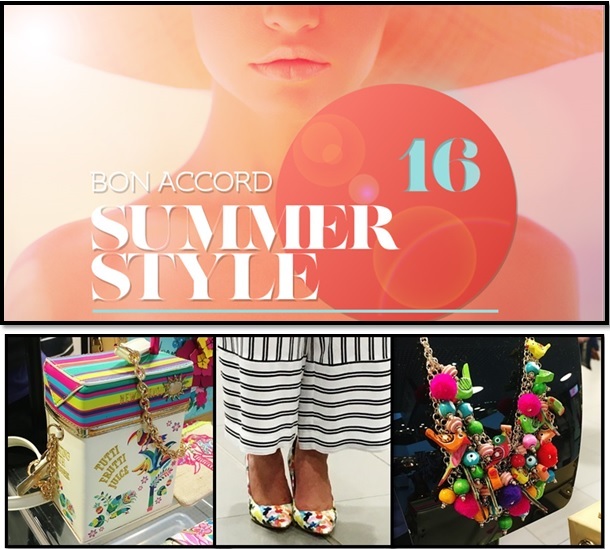 So, any help, as you can imagine, is greatly appreciated, and when I saw an invitation to Aberdeen's Bon Accord Centre for their summer style showcase of 2016 I was pretty intrigued. Showcasing all of the hottest summer trends for this year all of my favourite brands were out in full force, everyone from Benefit and Warehouse to newbies such as Jigsaw and scotch favourite Ness, everyone had something unique to offer us for the evening. Focusing on dewy, summer skin, the beauty brands were out in force with new tanning solutions (not my cuppa), highlighters in all shades of the unicorn rainbow and of course glosses, glosses galore which I was only too happy to sample! The fashion brands gave us such great pointers for how to combine the hottest prints and textures of the season with colour pop bags by Coach which helped me leave with oodles of fashion inspiration and a shopping list as long as my arm. I was glad to see that the brands didn't just throw the top summer trends from the magazines at us, as I feel they so often miss the mark when it comes to weather. Bon Accord were great in that they displayed coats, jackets, handbags that weren't ridiculously tiny and all of it wearable! Overall I was pleased to find that a lot of this summers trends are pretty up my street, and hey I may even add a pop of colour if I'm feeling super daring, what are your top summer picks? Be sure to leave your summer staples in the comments below, come share them with me on Twitter, or if you just can't get enough you can catch me on Bloglovin, Instagram and Facebook! I loved shoes! And of course Coach bags, would't mind getting myself one as a treat! They were gorgeous and the bags too! Bit out of my price range I think for the moment but a girl can dream.